Jeanne Crain, the winsome beauty who starred in lightweight 1940s romances and comedies and won an Academy Award nomination as a black girl passing for white in the controversial "Pinky," has died. She was 78. Crain, who was white, died of a heart attack at her Santa Barbara home early Sunday morning, according to her son, Paul Brinkman Jr. She appeared in 64 films and many television shows during her long career, playing opposite such stars as Frank Sinatra, Kirk Douglas and William Holden. With her lovely features, slender figure and demure manner, she became a leading star in the wartime and postwar years. For faraway GI's she seemed the ideal girl back home. At 20th Century-Fox studio, her fan mail was second only to that of pin-up queen Betty Grable. Crain's 1943 movie debut followed the Hollywood cliche: She appeared in a swimming suit beside a pool in the all-star "The Gang's All Here." She was elevated to leading roles in her next films - "Home in Indiana," "In the Meantime, Darling." "Winged Victory" and "State Fair," which featured Rodgers and Hammerstein's only original score for a movie. "Margie" (1946), an entertaining, nostalgic tale of a small-town girl in the 1920s who gets a crush on her French teacher, established Crain as an important Fox star. She followed with a musical, "You Were Meant for Me," opposite Dan Dailey, and "An Apartment for Peggie," a romance with William Holden. "Pinky" brought Crain's only Oscar recognition, a nomination for best actress in 1949. It was a daring film at a time when Hollywood avoided racial controversy, about a girl who passes for white in the North but faces the bitter hatred of whites after returning to her grandmother's home in the Deep South. "I grew up without knowing anything about prejudice; my mother saw to that," Crain said in 1995. "If parents would keep prejudice and intolerance to themselves for one generation, we would have a different world." Lena Horne and other black actresses sought the role, but Fox boss Darryl F. Zanuck decided on a white star with box-office appeal. "Pinky," directed by Elia Kazan, was widely praised by critics but encountered opposition in the South, especially because a white man in the film wants to marry Pinky despite knowing her heritage. Marshall, Texas, banned the film, but the town's film censoring ordinance was declared unconstitutional by the U.S. Supreme Court. The movie's controversy enhanced Crain's popularity. She recalled that her fan letters rose to 6,000 a week, and only 1 percent were critical. Crain was born in Barstow, Calif., on May 25, 1925. Nine months later, her family moved to Los Angeles, where her father became head of the English department at Inglewood High School. She began winning leads in school plays at 14 and beauty contests at 15. As Camera Girl of 1942 in Long Beach, she attracted the attention of 20th Century-Fox and was given a routine studio contract. That was soon discarded for better terms as her career rapidly ascended. In 1945, Crain married Paul Brinkman, an actor who later became a successful businessman. The couple had seven children. 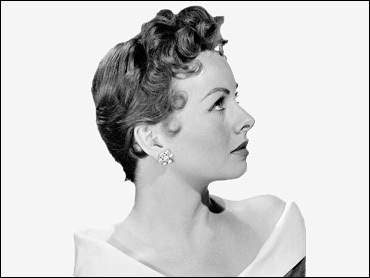 In 1956, Fox granted Crain's request to be released from her contract, and she enjoyed a brisk career as a free-lancer, notably in "Man without a Star" with Kirk Douglas, "The Fastest Gun Alive" (Glenn Ford), "The Joker Is Wild" (Frank Sinatra), "The Tattered Dress" (Jeff Chandler), "Guns of the Timberland" (Alan Ladd), and "Madison Avenue" (Dana Andrews). By the 1960s, her Hollywood career had dimmed. She made three films in Europe and then retired. She and Brinkman spent their time at two working ranches. In her 70s she still received regular bundles of mail from fans who had seen her films on TV or video. "They write as if the films were just being released," she said wonderingly. "The films must have aged well." Crain's husband died in October. She is survived by her sons, Paul Jr. and Timothy Brinkman, and three daughters, Jeanine Brinkman, Lisa Binstock and Maria Brinkman.